If you’ve read the earlier posts, skip to the next paragraph. For those who haven’t, here’s the abstract: Where I work, we deal with imagery that is often tiled into a grid of tiffs, sids, or ecws. 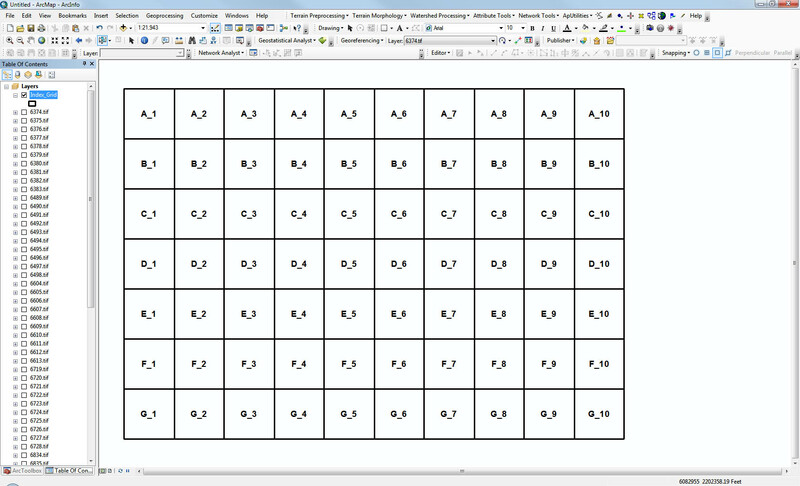 We have (or we create) an index shapefile that shows where each tile is in the grid. Sometimes I have wanted to rename the tiles for a variety of reasons. I figured that just as a field in the attribute table contains the current name of each tile, I could add a field and populate the names I want them to have. Then, using a Python script, I could read the values in these two fields for each record, and rename the files in a given folder from the existing name to the desired one. So, the bare bones version of this script is in my last post. 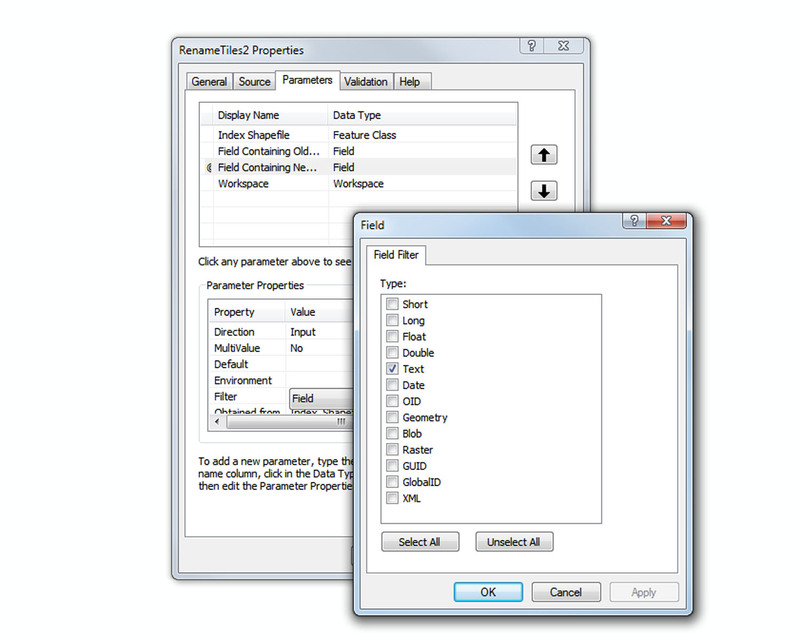 Basically, it takes four parameters: the index shapefile, the field name corresponding to the current file names, the field corresponding to the desired one, and the folder containing the files. Then the script creates a search cursor, and then goes through the records getting the values from each of the designated fields, and renames the files from the current name to the desired one. Now, before I really start fleshing out the bare bones, I want to make sure the bare bones work as a script tool, right? So I right-click in the ArcToolbox window, add my custom toolbox, and then right-click the toolbox and add a script. I give it a name, a label, and a short description, and I like to check “relative paths”. I hit “Next”, and navigate to my script. I hit “Next”, and then here’s where it can start to get a little complicated, depending on the script and the parameters. Keeping the script open in IDLE for reference, I fill in the parameters. I give them the following Display Names: “Index Shapefile”, “Field Containing Old Name”, “Field Containing New Name”, and “Workspace”. I set the data type for the first of these to “Feature Class”. For the next two, I choose “Field”, and for the last I choose “Workspace”. So far, so good. I highlight “Field Containing Old Name”, and in the lower Parameter Properties window, I scroll down to “Obtained from” and choose “Index Shapefile”. Furthermore, since I want to use text strings, I click next to “Filter”, choose “Field”, and then uncheck all but the “Text” box. I repeat this for “Field Containing New Name”, hit “Finish”, and now the script tool appears in my toolbox. Hit go, and after a few seconds I can see in the ArcCatalog window that my files have been renamed! Yay! In Part 2, I’ll define a function to modify the names, test it in IDLE, incorporate it into the script, add the necessary parameters, and add a simple little line to the tool validation tab. Elsewhere I posted a script that I wrote to allow me to do this same task, to rename imagery tiles based on attributes in the index shapefile. It wasn’t perfect, and it had a couple extra steps, but I wrote it pretty quickly and it worked well enough. If you want to, you can read more about it on that other post, or the example application linked from there. I thought it might be helpful to post not only scripts that I’ve created, but why and how I use them. As written, these scripts tend to be fairly short and simple, but also very specific to some task I do repeatedly at work, or that I suspect I may have to redo multiple times with slight changes, and which would be tedious to do manually. In short, I thought an example might provide a helpful context for the scripts themselves. 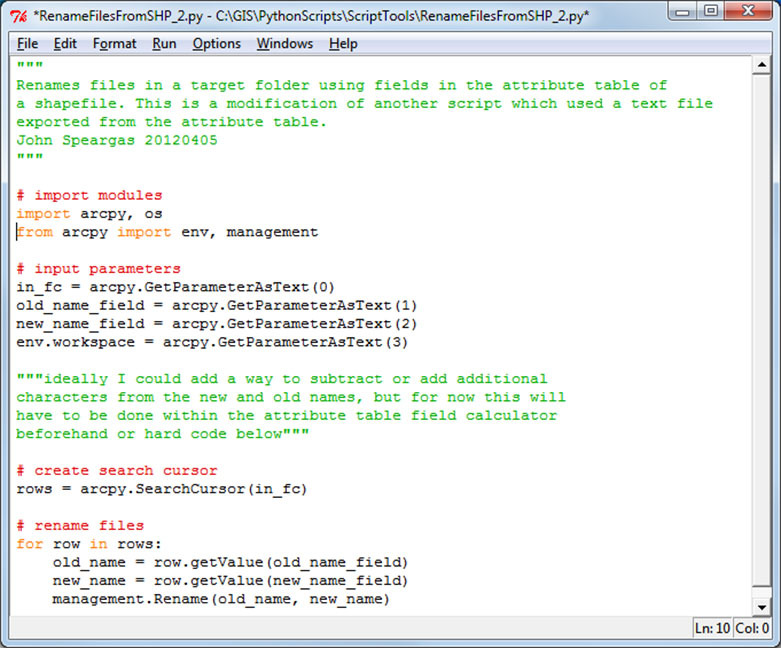 This example uses the script from the post titled “Python script to rename files based on a shapefile attribute”. At work, I deal with aerial photography. This imagery may come to us in tiles, a grid of geotiffs, for example. Sometimes customers desire that we deliver the imagery to them cut into a different tiling scheme in order to keep consistency with their imagery from previous years, or with some other data layers or boundaries. Sometimes, when compressing an area to .ecw or .sid we may need to break up an area into some arbitrary tiling scheme to balance file size with image quality. In those cases, I find the script from my post “Python script to rename files based on a shapefile attribute” to be useful. I could also see this as possibly be useful with, say, a NED dataset from the USGS with a metadata shapefile. 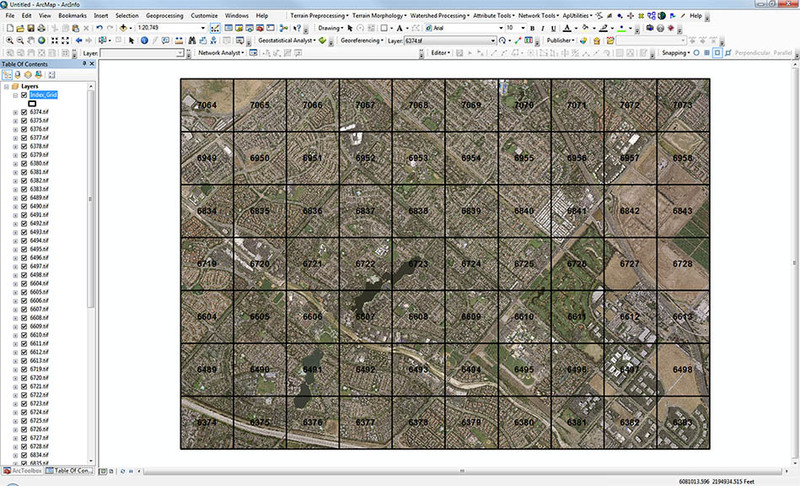 Perhaps in another post, I’ll go into more detail about how to create a tile index for the imagery — for now I’ll just say in brief that it can be accomplished in a few ways — it can be done using ER Mapper (create a mosaic using the Mosaic Wizard, then create a Mosaic Tile Index Grid using the mosaic) , Global Mapper (select layers in the Control Center, right click, and choose Create Area Features from Selected Layer Bounds), and I think with a little creativity there is some way to do it ArcMap 10 as well. First, let’s start with a raster dataset–I’ll use imagery –and an index shapefile of some sort. The attribute table currently has a field called “TIFF” that contains the number of the tiff that fills the extent of the corresponding feature. Now, I want to replace this incomplete, sequential, bottom left to top right numbering scheme with one that is more convenient for our customers using rows and columns. 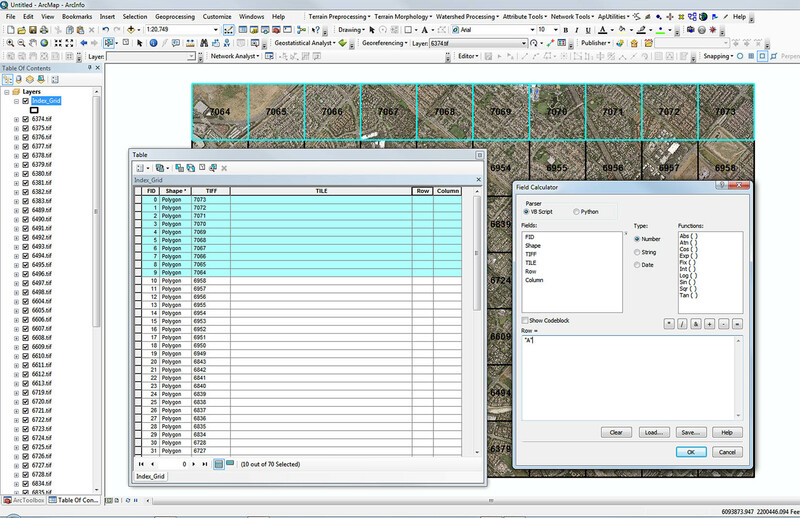 I begin by adding three fields: “TILE”, “Row”, and “Column”. 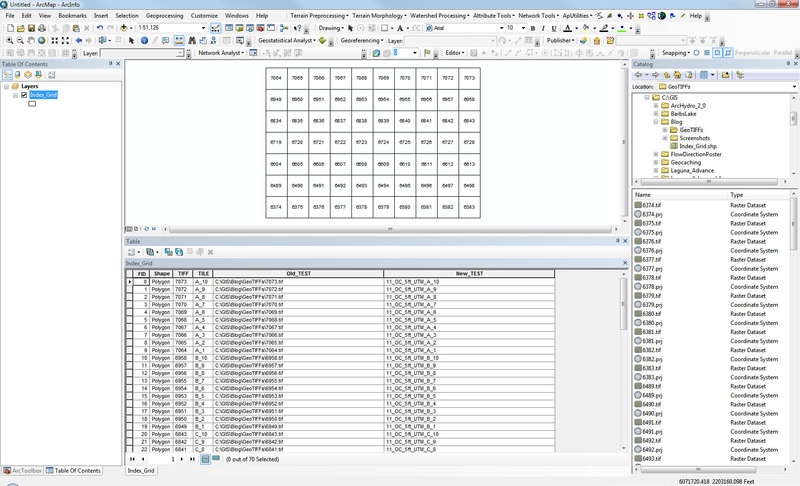 I use the Select Features tool to select all features in a row, then use the Field Calculator to populate the “Row” field with “A” for the selected features. Rinse and repeat until all records have a value for row and column. Manually selecting rows and columns can be a little unwieldy for a large number of rows and/or columns — I may try to write something to automate this step eventually, but so far I haven’t found it necessary. 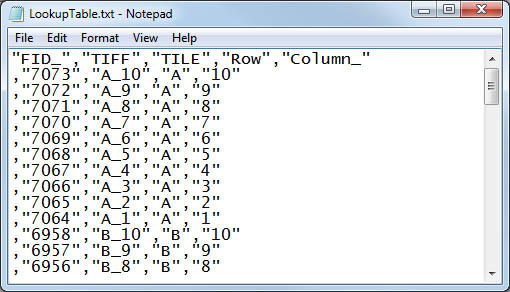 Once I have the rows and columns done, I use the Field Calculator to fill the “TILE” column. In this example I simply use the row and column separated by an underscore. Now, if I change the label field to “TILE” instead of “TIFF” for the index shapefile, the new naming scheme is displayed. Now I just have to get the names of the tiffs to match! 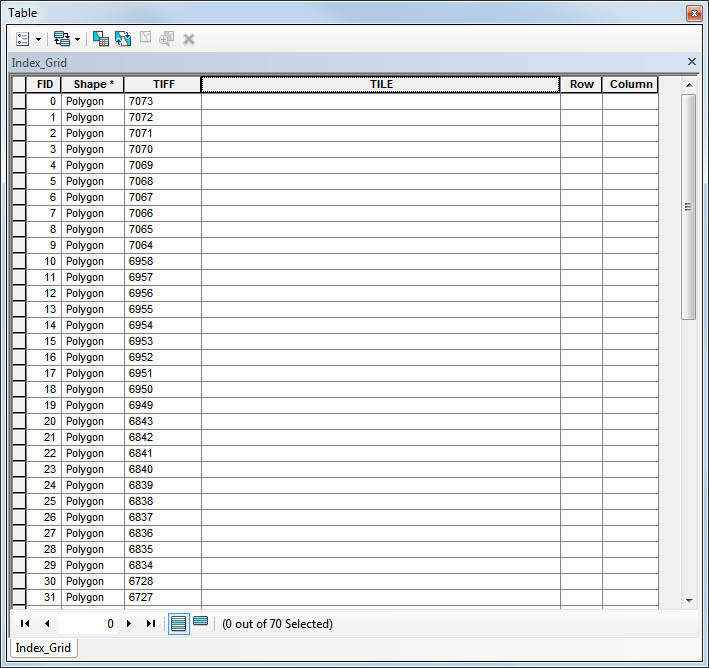 First, from the Attribute Table for the index, I export to a text file. The way I have the script set up, this table has to be in the same folder as the tiles to be renamed. Now I open the script in IDLE, and make sure the path, text file, and the fields corresponding to the old name and the desired new name are set. 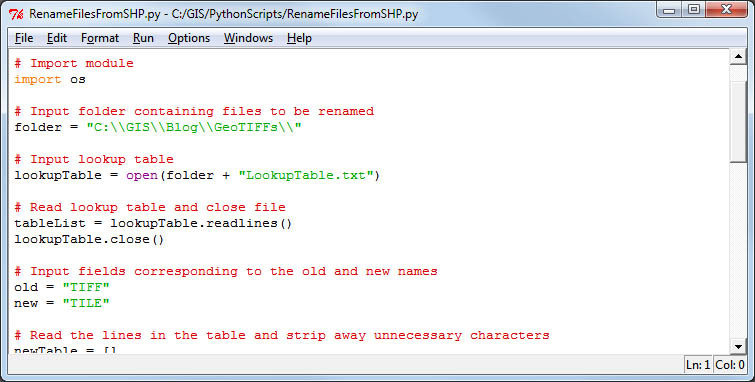 Run the script, and the files are renamed to match the “TILE” field in the index shapefile. At this point I’d probably load the newly renamed tiffs into ArcMap along with the index and make sure everything is good, then delete the “TIFF” field from the shapefile and LookupTable.txt from the folder to avoid confusing the customer. And, we’re done! I realize I have not been terribly thorough in giving instructions with the scripts I have posted so far. 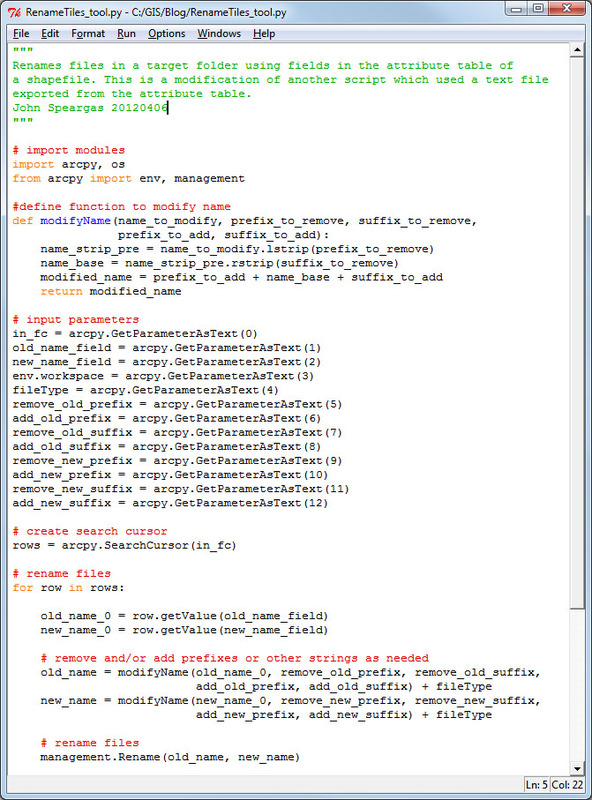 They have been short and relatively simple, but in order to use them, I think you would have to be familiar with the process of running a Python script from IDLE and/or creating a script tool in ArcMap. I am using ArcGIS 10 at home, but at the office I have ArcGIS 9.3.1 installed, so the scripts and the methods by which I run them are different depending if I am at home or at work. I will try to remember to be specific about which I’m using, and give more details about how to run these scripts or import them to script tools and so forth in the future. (1) If you see “import arcpy” near the top, I am using a computer with ArcGIS 10 and Python 2.6. If you see “import arcgisscripting” I am using a computer with ArcGIS 9.3.1 and Python 2.5. (2) If you see lots of variables hard-coded, meaning things like “elevInput = ‘C:\\GIS\\TEST_FOLDER\\elev_10m'” then I have written the script to run from IDLE. If you see “elevInput = arcpy.GetParameterAsText(0)”, then I have written it to be used as a script tool. First, get familiar with ESRI’s online help if you aren’t already. 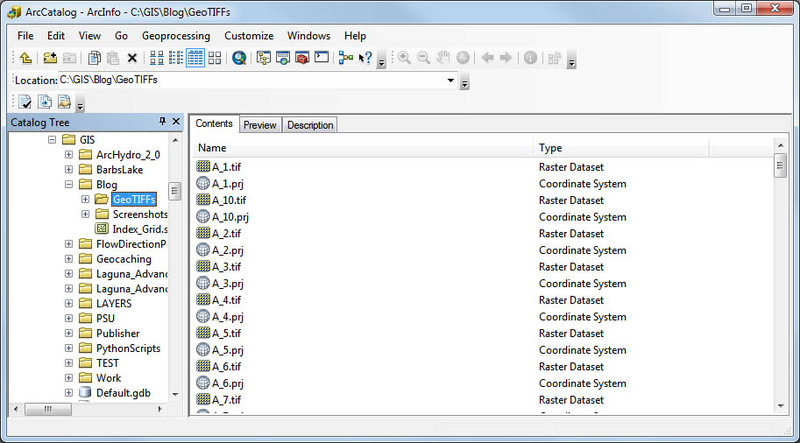 For ArcGIS 10, go to http://help.arcgis.com/en/arcgisdesktop/10.0/help/index.html and get familiar with the Geoprocessing Tool Reference (Professional Library > Geoprocessing > Geoprocessing Tool Reference). Also check out the bit on Creating Script Tools (and off of that, Customizing Script Tool Behavior) under Geoprocessing. For 9.3.1 Geoprocessing and Geoprocessing Tool Reference are both on the root at http://webhelp.esri.com/arcgisdesktop/9.3/index.cfm?TopicName=welcome. These are extremely helpful as they provide examples and details about the parameters. Okay, now Python-wise, I recommend Mark Lutz’s book Learning Python (http://www.amazon.com/Learning-Python-Powerful-Object-Oriented-Programming/dp/0596158068/ref=ntt_at_ep_dpt_2). Personally I bought the 3rd Edition because it was cheaper and covers up through 2.6, which is what Arc 10 uses. Also, through Penn State you can access quite a lot of stuff from an online course for free at https://www.e-education.psu.edu/geog485/. There are other resources worth a look at http://open.ems.psu.edu/courseware, while you’re at it. And you might as well read through some of Dive Into Python: http://www.diveintopython.net/toc/index.html, and bookmark docs.python.org. Okay, now don’t get overwhelmed– I think it was Lao Tzu who said what has generally been translated to “A journey of a thousand miles begins with a single step.” The journey may seem overwhelming, but you can surely handle a single step. And after that, take another when you are ready. And another. And we’re underway! Selects each feature in a feature class and exports each to a new shapefile. 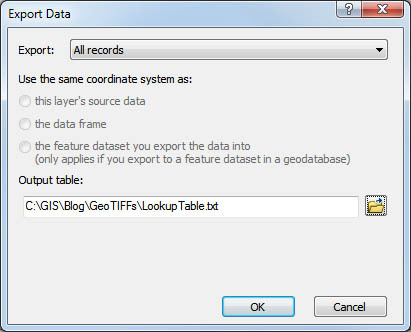 This script is set up to be added to a toolbox in ArcGIS 10. 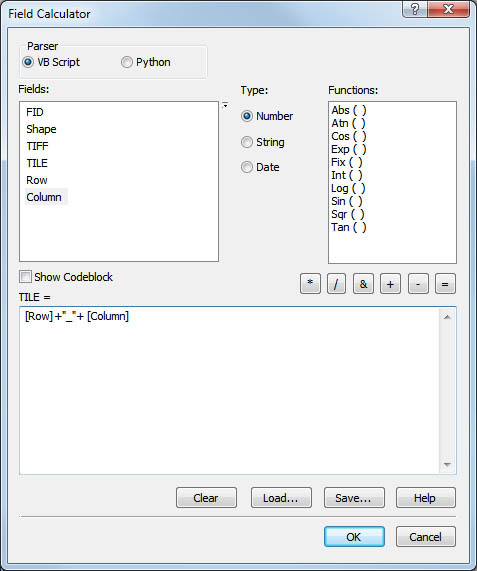 I set up the script tool parameters as shown in the dialog box below. 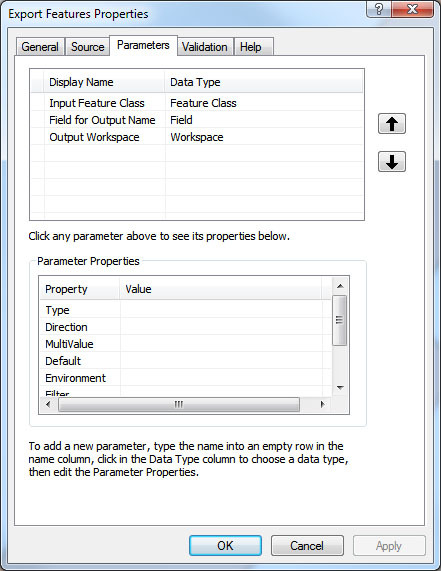 When you select the second parameter, the field based upon which the new features should be named, in the lower part of the dialog box click next to “Obtained from” and select the input feature class parameter. The script is below. In another post, I show an example of how I use this script. It meets a specific need I encounter periodically at work. The application is pretty specific, but I think it is an example of how a simple script can augment GIS skills, so look for that post coming soon. Please note that if you copy this script from this page and paste it into IDLE you will probably have to go through and replace the quote marks (both single and double), as well as the two minus signs, as they seem to copy over incorrectly. This can be accomplished quickly by using “Edit > Replace”, copying the incorrect quotation mark into the “Find” field, and entering the correct one in the “Replace” field. Repeat for each incorrect character. be in the same folder as the target files, or the code changed accordingly. After posting a note on facebook hypothesizing that perhaps the graph shown in the previous post showed that the flow direction algorithm was biased toward the ordinal directions. Brian agreed that there was an artifact here, perhaps as a result of the algorithm, or possibly of the gridded nature of the elevation raster itself. 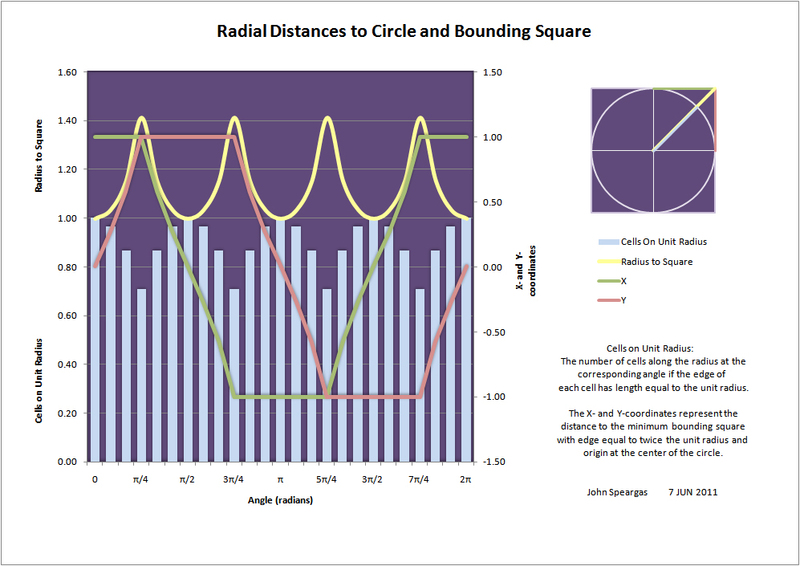 Brian suggested a couple of tests, involving conversion from raster to point and reinterpolating the raster, converting to contours and then using topo to raster, or smoothing using focal statistics. I did not try any of these, because I did not want to open the interpolation can of worms here, per se, because I thought it might essentially introduce another variable and muddy the source(s) of bias further. I had reprojected the data from NAD83 to State Plane, because otherwise slope never comes out right, and this projection introduced an artifact mesh. After a little back and forth on this, Greg chimed in that DEMs are highly inaccurate to begin with as a result of data collection. , and that conversion back and forth only propagates the error. I realized that the sine wave implies a D-infinity flow algorithms–that is, flow could be calculated in any direction from the cell center. This is, of course, not what ArcGIS actually does. 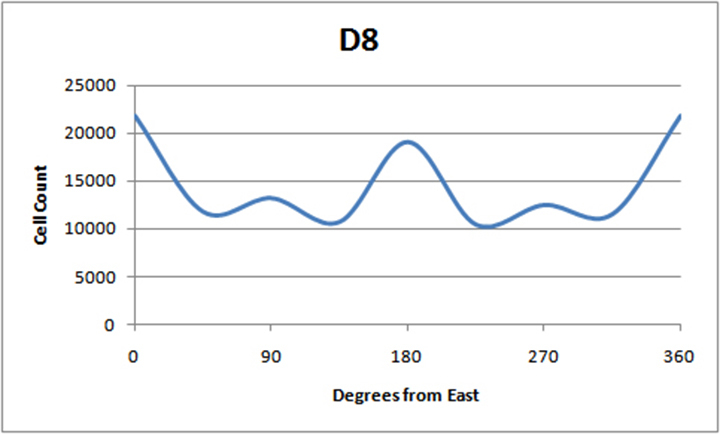 What the graph should really show is 8 columns to represent the 8 discrete directional possibilities from one cell to any of its eight neighbors. What occurred to me at this point is that for any of these 8 possible directions, the cell count will not be the same at a given distance. If, for example, one measures the distance from the center of a cell to the center of each neighboring cell in the ordinal directions (diagonally), then the distance will be the cell width multiplied by the square root of two, and we can call the cell count 1. Assuming that cells can be partially counted, then the same distance in the cardinal directions will cover about 1.414 cells. Therefore, the pattern I noted may be nothing more than the geometry of a square, causing cell counts to be relatively lower in the ordinal directions for exactly the same flow length. I thought a way to test this might be to clip a circular extent and rotate it. It should be possible to remove the effect of this geometry by using a factor of the square root of two, and then to see whether the same number of cells is calculated for each angle of rotation (corresponding to the 8 directions in question) when the angle is accounted for. I made a graph that shows how I believe the pattern should change for an identical area as it is rotated through a full rotation at 15-degree increments. Recently, as I was playing around with the DEM for what I will undoubtedly inadvertently refer to as “my watershed”, as if I own it. The watershed in question is a small one…I don’t know the area off the top of my head but on my other screen here I have ArcMap open, so…looks like 707392.5 square meters, according to the Shape_Area field of the watershed polygon I converted from the basin computed from the flow direction based on the filled 1/3″ NED. Bit of false precision there, I’d guess…for convenience and because really what I wanted to express is the order of magnitude, let’s just call it 707000 sq m, which I guess is what… 0.7 square km, as a ballpark figure. It’s at the upper part of the Laguna Canyon watershed, in the sort of northeastern San Joaquin Hills, conceptually defined as the area draining to Barbara’s Lake. I was looking at the DEM for a squarish area covering an area several times larger than the watershed. Again, I have Arc open, so…about 800 cells on a side, so about 8 km on an edge, 64 sq km overall. And I was looking at the flow direction raster for the area of the watershed and thinking that because the bulk of drainage, that is, the accumulated overland flow, should go southwest toward Laguna Canyon and out to the Pacific, to the adjacent parallel canyon and in the same direction, or to the northeast corner of the map where it goes out onto the plain and turns south, ultimately to the Pacific as well. Clipped in tight, it should all go southwest. But how does the flow accumulation, I wondered, compare with the flow direction. So I opened up the attribute tables and took a look at the count of each cell classification in the flow direction raster. I won’t go deep into the various tools I mention here…rather, I would refer you to ESRI’s online desktop help page http://help.arcgis.com/en/arcgisdesktop/10.0/help/index.html#//009z00000052000000.htm, where you can find more detail. I copied the numbers over to Excel and made first something that looked kind of like a scree plot, for those who know what that is. The labels below the horizontal axis were ordered highest count to lowest. To my initial surprise, the majority of cells were classified east, followed by west. The other directions all had much lower values, but north and south were next. I could see most of the flow being east and west, perpendicular to the ridges and the channels–that makes perfect sense, but why then north and south, rather than northeast, southeast, northwest, southwest? I sorted in numerical order so that the axis began with due east and went around in a circle clockwise. With a smooth line fit through the numbers, it looks a bit like a sin wave with some kind of amplitude boost every other upward peak. Really, because ArcGIS calculates flow to the 8 neighboring cells, a more appropriate graph would reflect the discrete nature of the possible values, but I include the graph here uncorrected in this regard. I posted a note on facebook showing this graph, and pondering whether this pattern, each peak corresponding to one of the cardinal directions (E, S, W, N) and each trough one of the ordinal (SE, SW, NW, NE), was an artifact of the gridded data, perhaps bias introduced by something in the flow direction algorithm. I received some feedback from colleagues at Long Beach, Brian Nagy and Greg Ziolkowski, stimulating and combining with some of my own evolving thoughts on the matter, which I well get into next blog.